Patek: extract from the archives . What is it? Many second hand Patek Philippe time pieces come with an “extract from the archives” . What is it ? Regrettably many watch owners don’t keep their original certificate (not to mention the boxes) and when they come to sell their time piece to a dealer like me the watch comes with no documentation. Patek Philippe maintains an archive of all the watches manufactured and sold since their inception . It is possible then to log on to the Patek website and request a document that confirms the date of manufacture and date of sale of the watch linked with the movement and case number of the watch considered. How do you request an extract from the archive then? Every Patek Philippe movement is individually numbered and so is the case of the watch. Those figures are linked to the specific time piece and that is how the record can be sorted out. Is the archive a proof of authenticity? In my opinion yes because how otherwise would they issue an original document from their Geneva headquarters if the numbers weren’t legitimate. They also ask you to send pictures to confirm the watch really looks like that in their records. 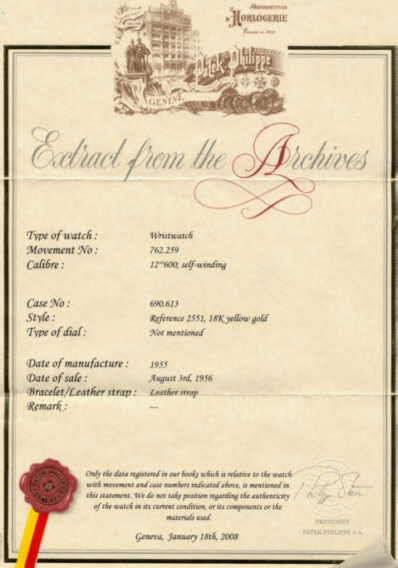 Many Pateks are sold at auctions with an extract so you can be sure it is a legit document. Other brands don’t have this kind of luxury. If Rolex kept an archive so many vintage watches would sell easily and with peace of mind. wow this watch is vintage..